What Is the Difference in Mens & Women's Golf Balls? Kevin Bliss began his professional writing career in 1994. Since that time he has completed over 15 feature-length screenplays. He has also had articles published in "The Journal of Modern Screenwriting." Bliss received his Bachelor of Arts in English from Arizona State University and his Master of Science in film (with an emphasis on screenwriting) from Boston University. Golf balls appear to be identical to one another in every meaningful way. They are all the same size and all feature a dimple pattern around the entire covering. The manufacturing and composition of golf balls, however, differ significantly from one model to another -- particularly when it comes to golf balls specifically designed for women. 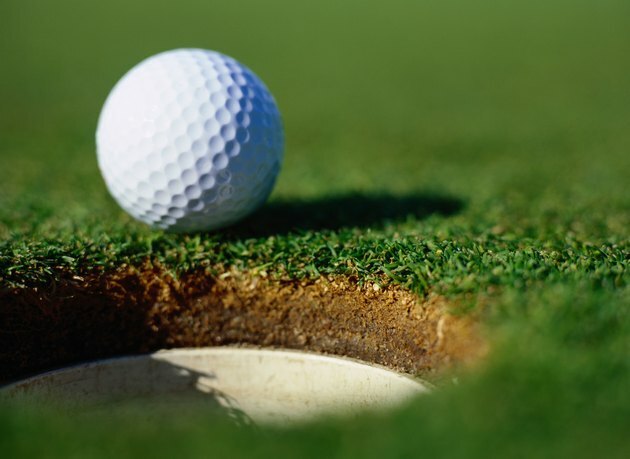 According to knetgolf.com, the compression of a golf ball has to do with the force required to flatten the ball somewhat at impact, adding a spring effect to its flight. Harder golf balls -- made for golfers with faster swing speeds -- need greater force to create compression. Consequently, ball manufacturers design softer balls for those players with slower swing speeds. Generally speaking, female golfers have slower swings than their male counterparts, resulting in golf balls designed for women featuring a softer core. In order to distinguish the varying hardness and softness in their golf balls, manufacturers have started marking most balls with a specific compression rating. The number, which indicates the density of the ball clues golfers in to what swing speed best matches any ball in question. Typically, balls intended for use by men feature a compression rating of 80 to 100. Balls designed for women tend to have a compression rating between 60 and 70. Ladiesgolfball.com recommends female golfers take their time experimenting with several different brands and models intended for women. One of the features that experimentation may help uncover is the dimple pattern forged onto the surface of the ball. Dimple patterns have the potential to change the aerodynamic qualities of the golf ball. Some balls fly higher with a slower swing speed largely because of the number and arrangement of the dimples. For women experiencing difficulty managing a desired trajectory, such balls provide extra help. Ladiesgolfball.com also points out that a superficial distinction between balls designed for women and those generally intended for men involves their 'look'. Rarely do golf balls for men come in a variety of colors or feature a glittery covering. While it might seem purely sexist to serious golfers for these differences to create a visual distinction between balls, women's golf balls also come in white with all of the desired characteristics. Consequently, women should look beyond the colors to make sure a ball fits their needs. Ladies Golf Balls: Why Use Ladies Golf Balls? Can Women Play With Men's Golf Clubs?